Have you upgraded your Office 2013 install to Office 2016 using Office 365 subscription and not happy with Office 2016? Want to legally downgrade from Office 2016 to Office 2013? In this guide, we will discuss how to downgrade from Office 2016 to Office 2013 with ease. Having been available for close to two months now, millions of PC users have already upgraded to Office 2016. While Office 2016 is a minor upgrade to Office 2013, there are many users who have upgraded to Office 2016 and now want to revert to Office 2013 for a variety of reasons. First things first. Downgrading from office 2016 to Office 2013 is possible only if you have an active subscription on Office 365. This downgrade option is also useful for users who recently purchased Office 365 subscription (which now installs Office 2016 by default), but prefer to install Office 2013 instead of Office 2016. In order to downgrade from Office 2016 to 2013, you will need to deactivate your existing install of Office 2016 first, uninstall the same from your PC, download a fresh copy of Office 2013 from Microsoft, and then install Office 2013 on your PC. 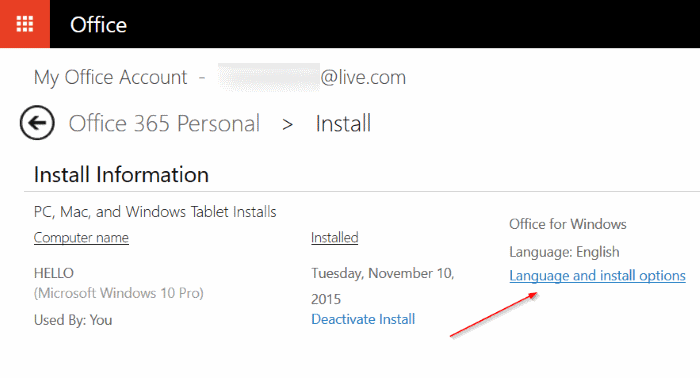 Step 1: Sign-in to your Office account and deactivate your installation. 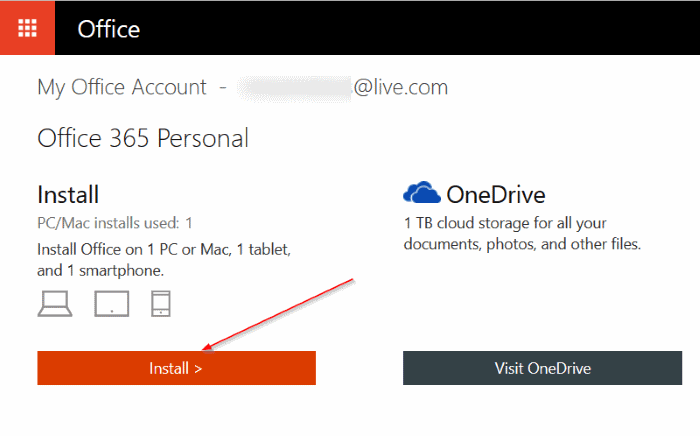 Since we have already published a detailed guide, we request you refer to our how to deactivate Office 365/2016 install guide for step-by-step directions. 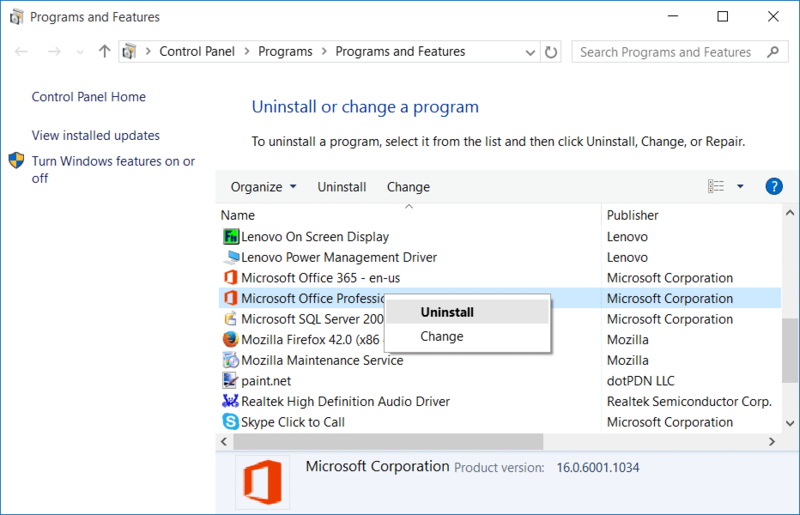 Step 2: Once Office 2016 is deactivated, uninstall it from your PC. To do so, type Programs and Features in Start menu search box and press Enter key. 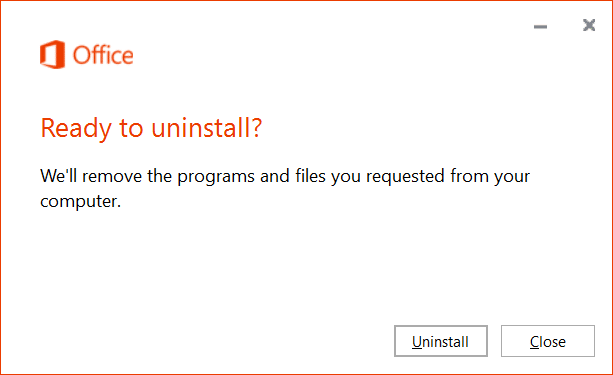 Right-click on Office 2016 entry, click Uninstall option, and then follow on-screen instructions to completely uninstall Office 2016. 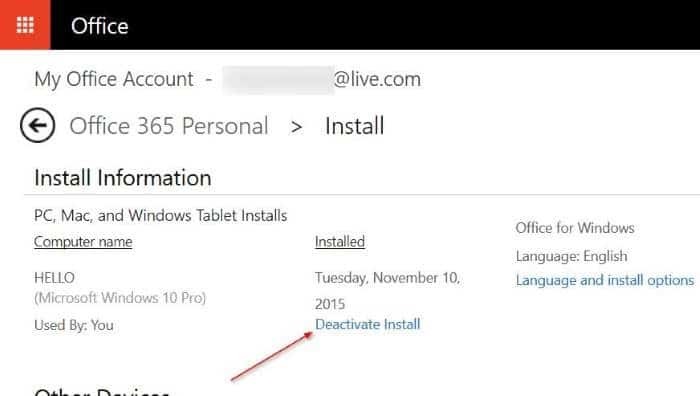 Once Office 2016 is removed, please reboot your PC once. 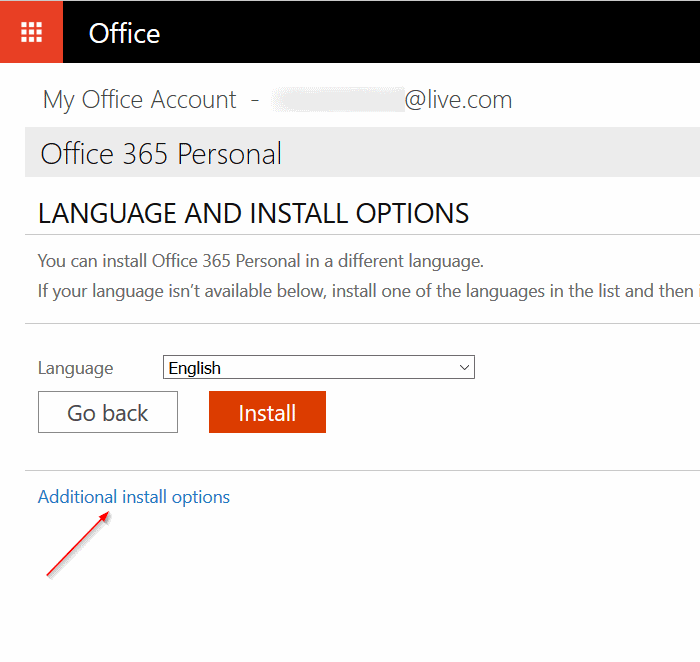 Step 3: Sign-in to your Office account again, click Install button to open Install Information page, and then click Language and install options link (refer to the screenshot given below). 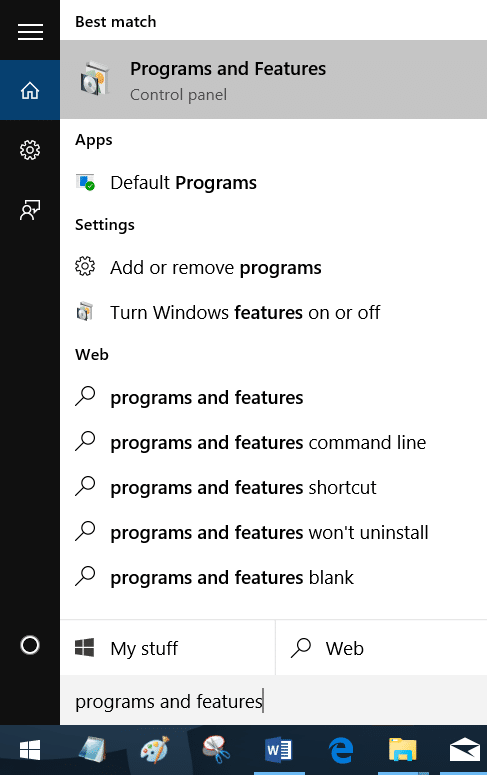 Step 4: On the Language and install options page, click the link named Additional install options to open the same. Step 5: Here, under 32-bit and 64-bit versions of Office section, click on the drop-down box next to Version (refer to the picture below), select either Office 2013 (32-bit) Office 2013 (64-bit), and then click Install button to download the web setup of Office 2013. And if you prefer to download the offline installer, please click the Download offline installer link instead of Install button. 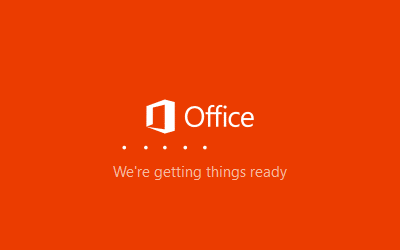 Step 6: Run the installer on your PC to download and install Office 2013 on your PC. 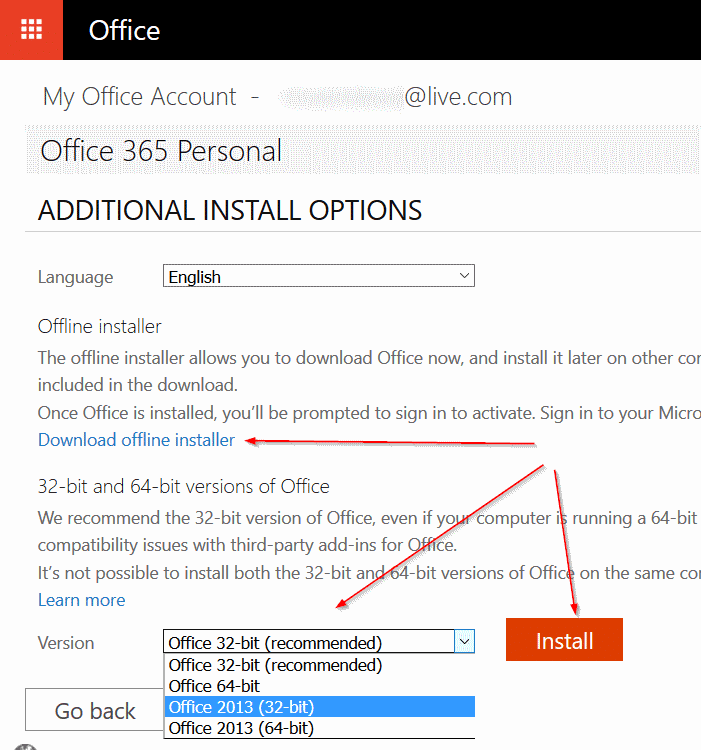 Once installed, launch one of the applications of Office 2013, and sign-in using your email address which you used to subscribe to Office 365 to activate your Office 2013 install.